Last night, we invited SP's dad over for dinner. Whenever my parents are in town, we have a dinner with SP's dad. SP had to work, so he arrived late for the appetizer/cocktail part of the meal. The rest of us gathered on the deck around 3:30 pm, which was right around when the sky started to clear up a bit and things got a bit brighter and a bit warmer. SP's dad brought a plate of sushi, which I forgot to photograph before we ate it all!! There was spicy tuna & salmon, a seaweed salad, crab, a teriyaki eel, and I forget what else! We enjoyed the sushi with some wine. After sushi, it was time for Hot Artichoke Dip. This recipe is from a former colleague - she brought this dip on one of our 'Food Days' and it was delicious so I asked for the recipe. 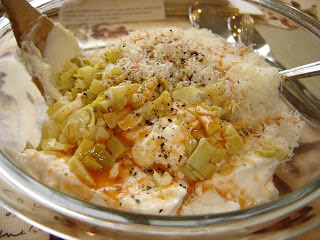 It's very simple: equal parts sour cream and mayo, chopped artichokes, parmesan cheese, hot sauce, and salt & pepper. Mix it all together and heat in the oven until bubbly, serve with chips. We've made a few changes to the basic recipe - for instance, we like a few more artichokes than a 6 ounce jar and we add a bit more than the half cup of parmesan cheese. 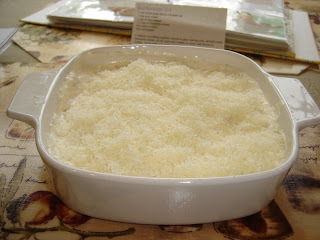 Plus, we like to add extra parmesan on top for a nice melted parmesan layer! I forgot to photograph the finished, bubbly dip. and we ate it all before I remembered!!! Yum! We think it's even better after it cools a bit.